My Two Cents: I’m quite the latecomer and newcomer to Eisner. I heard his name for years of course, then attended a comics panel at DragonCon 2017 where Larry Hama and others discussed Eisner’s influence. I finally got a Spirit anthology and this trio of graphic novels for Christmas 2017, and yes, I was impressed as advertised. These three graphic novels are part of a collection looking at working-class lives in New York City. “A Contract with God” shows the dangers of feeling entitled when it comes to the Divine; God is nobody’s lackey and certainly doesn’t feel bound to our one-sided “Get me out of this jam and I’ll read the Bible every day” offers. 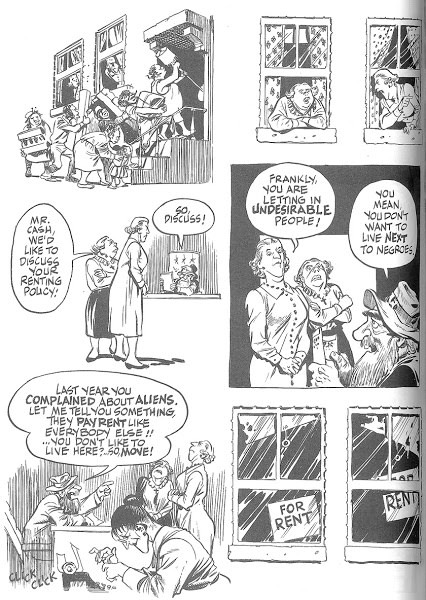 “A Life Force” shows various cross-sections of society coping with the deprivations of the Great Depression and the looming threat of Nazi Germany. But for me the tour-de-force is “Dropsie Avenue,” which surveys one hundred years in the life of a city block, as various families move in, multiply, engage in their generational triumphs and troubles, and see the neighborhood turn from farmland to mansions to tenements to crumbling facades to gentrified single family homes, with a glimpse of the cycle of rising and falling incomes beginning anew. It’s a fascinating “big picture” work that makes you think about your own place in the grand scheme of things, and Exhibit A in how comic books can be much more than men in tights punching each other.